A man who later died after a fight at a local Denny's was initially going to be charged. HOUSTON, Texas -- For two weeks, the world's eyes have been on Houston after a violent chokehold caught on camera left one man dead and a sheriff's deputy and her husband indicted for murder. Here's everything that we know so far. 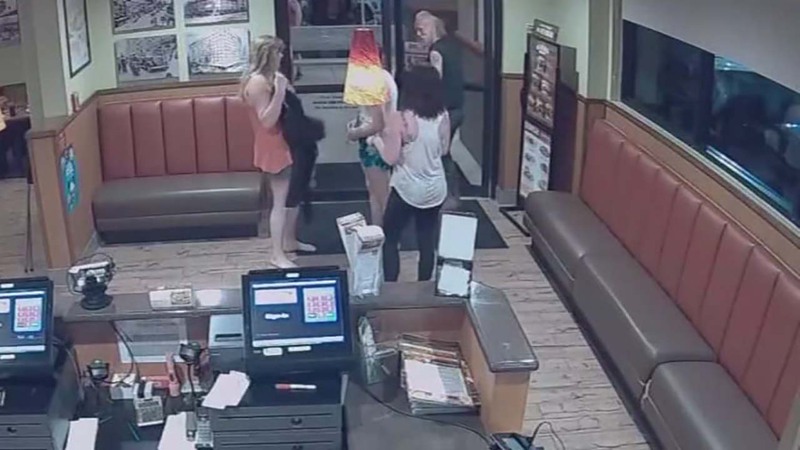 The violent confrontation took place late May 28, on the eve of Memorial Day, at a Denny's restaurant in Sheldon, an unincorporated community in northeastern Harris County. Surveillance video from inside the restaurant shows a scuffle outside and a man wearing an orange shirt taking another man down. He then holds him down for several minutes until authorities arrive. The man in the orange shirt was later identified as Terry Thompson. Family members identified the man beneath Thompson as 24-year-old John Hernandez. A man is fighting for his life after an altercation involving the husband of a Harris County Sheriff's deputy. Hernandez's wife said the fight began when her husband, who was drunk, went outside the restaurant to urinate and subsequently encountered Thompson. "They started fighting, talking [expletive] and first [Hernandez] punched [Thompson] and they started fighting. Then [Thompson] had him on the ground and would not stop choking him, just would not stop choking him," an employee at the Denny's told Eyewitness News just days after the confrontation. Thompson told investigators that he was defending himself after taking the first punch. The Harris County Sheriff's Office confirmed that sometime during the fight, off-duty Deputy Chauna Thompson, Terry Thompson's wife, arrived and also restrained Hernandez. The couple then noticed he wasn't breathing and "the off-duty deputy immediately began CPR and continued until EMS arrived and transported [Hernandez] to LBJ hospital for treatment." Hernandez was left in a coma following the violent altercation, and he died days later after he was taken off of life support. Forensics examiners have since ruled his death a homicide, saying he died from anoxic encephalopathy or lack of oxygen to the brain, due to strangulation with chest compression. A week later, harrowing eyewitness video emerged that gave investigators -- and the public -- a closer view of the melee that eventually claimed Hernandez's life. The man who shot the video claimed Chauna Thompson's daughter tried to block him from getting more video. Another man was also seen trying to get in front of the witness' cell phone, asking him to stop recording. Upon the video's release, Terry Thompson's attorney Scot Courtney said the footage did not paint a complete picture of what occurred and maintained that the Thompsons did nothing illegal. "They certainly don't show the beginning where Mr. Hernandez attacked my client. He was the initial aggressor," said Courtney. Even as the widely circulated and jarring eyewitness video stirred public outrage, no charges had been filed, and Deputy Chauna Thompson remained on duty until June 6, when she was pulled from patrol duty indefinitely. For Hernandez's family, the first break in the case came on June 7, when the Harris County District Attorney's Office announced that it would present the case surrounding Hernandez's death to a grand jury. After a day of testimony, the grand jury indicted both Thompsons for murder in the death of Hernandez on June 8. If convicted, they could each face five years to life. Couple indicted for murder in deadly Denny's fight, Elissa Rivas reports. "We believe that this grand jury true bill is a reflection of our community's belief that a crime occurred," Harris County DA Kim Ogg said after the indictment was handed down. "And that crime was murder and it was precipitated by Terry Thompson and his wife Deputy Chauna Thompson." Both Thompsons surrendered to authorities that evening and bonded out hours later. After the indictment was announced, the Harris County Sheriff's Office placed Deputy Chauna Thompson on unpaid leave. As the Thompsons await trial, the Harris County Sheriff's Office continues its internal affairs investigation into eight deputies' actions on the evening of May 28. Harris County Sheriff Ed Gonzalez launched the investigation the night of the confrontation, but Hernandez's family has since raised several concerns about the responding deputies' actions following the fight. In a news conference on June 9, Hernandez's wife said she was held in the back of a sheriff's patrol vehicle and questioned for hours, while the Thompsons were free to go. She also said deputies confiscated her cell phone. The wife of John Hernandez said she was held in a patrol car and questioned for four hours following the altercation that fatally injured her husband. Hernandez family attorney Randall Kallinen said sheriff's deputies contacted the district attorney's office that evening to request that a misdemeanor assault charge be filed against a gravely injured John Hernandez. The charge against Hernandez was provisionally accepted by the Harris County District Attorney's Office but never filed in courts because the information was incomplete, according to a spokesman for the office. The family has also raised concerns that homicide investigators were not called to the scene of the fight despite the grave nature of Hernandez's injuries. "They were not treated fairly. The investigation was shoddy and I feel the reason it was this way is because one of the individuals involved was the husband of a Harris County sheriff's deputy," Kallinen alleged. "This is a high-priority administrative review, and I ask that it be conducted in a timely, thorough manner," Gonzalez said in response to the family's claims. The Thompsons are expected in court the week of June 11.